Home > Find a Physician > Eugene Shostak, M.D. "My life passion has been to establish a state of the art complex airway, lung and pleural center that would serve as a regional and national referral center for patients with a wide range of advanced thoracic and pleural disorders. I am fortunate to join the Thoracic Surgery division at New York Presbyterian Hospital in the development of an interventional pulmonology program and join the team of thoracic surgeons, interventional radiologists, pulmonologists, oncologists and radiation oncologists in delivering high quality patient care through multidisciplinary approach. In interventional pulmonology we utilize the latest advances in technology to offer our patients minimally invasive options for the diagnosis and treatment of their disease. Since interventional pulmonology is a relatively new but rapidly growing field, many physicians may not be fully aware of all the available treatment options that exist for their patients. My goal is to advance the knowledge of interventional pulmonology in the community through educational seminars and procedure workshops. I also closely collaborate with device industries in advancing medical technology through clinical trials. By incorporating my prior training in pulmonary and critical care medicine together with my procedural skills in interventional pulmonology, I aim to provide patients with maximum options for diagnosis and treatment of their disease and deliver best quality care." Dr Eugene Shostak is an Assistant Professor of Medicine and an Assistant Attending Physician in Cardiothoracic Surgery who specializes in Interventional Pulmonology. After finishing State University of New York (SUNY) Downstate Medical School in Brooklyn NY, and completing his General Internal Medicine residency training at Lahey Clinic Medical Center in Burlington MA, Dr Shostak returned to NYC to complete his general pulmonary and critical care fellowship at New York Presbyterian Hospital Weill Cornell Medical Center. Following his fellowship training, Dr Shostak pursued a one year advanced fellowship training in Interventional Pulmonology at the combined Harvard Interventional Pulmonology program in Boston MA. Upon his return to NYC, Dr Shostak joined staff as an Interventional Pulmonologist at the Cardiothoracic Surgery Department at Weill Cornell Medical Center. His interests include advanced bronchoscopy for diagnosis of lung nodules utilizing a GPS-like guidance system termed electromagnetic navigation, evaluation of thoracic lymph nodes with assistance of endobronchial ultrasound, and endoscopic treatment of early lung cancer. Dr Shostak is one of few pulmonologists nationwide who is formally trained in rigid bronchoscopy and treats complex airway disorders such as tracheal stenosis, tracheobronchomalacia, and airway obstruction. Dr Shostak also offers a variety of treatment options for patients with pleural disorders such as ultrasound-guided thoracentesis with pleural manometry, placement of percutaneous chest tubes and tunneled pleural catheters, and medical thoracoscopy (pleuroscopy). Dr Shostak is involved in lung cancer screening program offered at New York Presbyterian Hospital. He also attends in the Intensive Care Unit and is trained in critical care ultrasonography. Eugene Shostak, M.D. 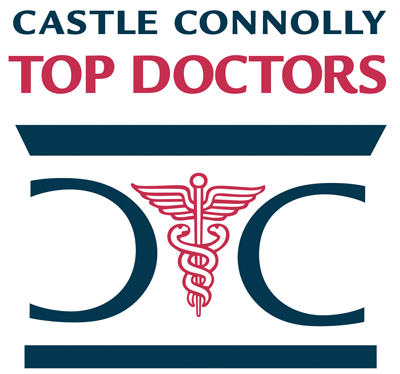 has been named one of America's Top Doctors by Castle Connolly. We have 384 of America's Top Doctors in 57 medical specialties.